Here is a good news for all those perusing master’s degree in Engineering, Geology, Geophysics, Mass Communication & Journalism, Hotel Management; Graduate in Engineering, Diploma in Engineering, ITI, MBA and MBBS that National Hydroelectric Power Corporation Limited is going to offer a fellowship program named “NHPC FELLOWSHIP SCHEME FOR ASSAM 2016” specially for the students of Assam. Under this fellowship program, students can get benefit up to Rs. 10,000 per month. So, check the eligibility criteria for the said fellowship below and apply before it’s gone. So, first and foremost, this scholarship is only applicable to the students who are domicile of Assam. Next criteria is that gross annual income of the family of the student should not be more than Rs. 2 Lakhs in a financial year. The students should not be availing any other financial assistance in any form. Must have obtained minimum 50% marks in the qualifying examination. The list of required qualifying examination, scholarship amount and number scholarship available for each respective courses are given in the table below. 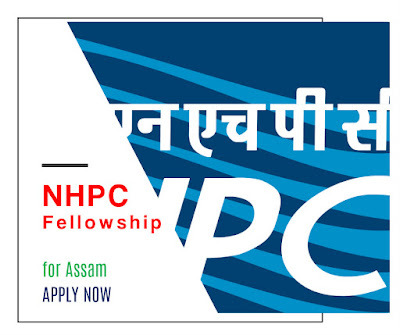 Candidates may download application form from the NHPC’s official website. The Link has been given below. Download the application form, take a print out and filled up. Along with all relevant documents duly verified and certified by the head of the institution, the application should be sent to the following address by speed post or registered post only. Download the Detailed Advertisement here.